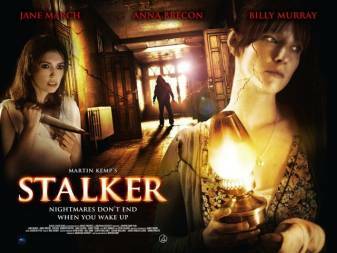 Stalker had its London Première last night at the Empire Leicester Square, which is cool. All of which is fantastic news. Congratulations to Billy and everyone else involved for their sterling efforts; but the most praise has to go to Martin Kemp for writing and directing this, his first feature film. For those who want to know more about last night, there are some photos and a post about the evening over at Shirlie Kemp’s blog. The film is in selected cinemas this week, I would give you a list; but I haven’t got one. So I’m not. If, however, you happen to live near a cinema where it’s showing, then it’s showing at a cinema near you! If you don’t, it’s not.